Andrew Calica (Wareham) poses with his Thurman Munson trophy as the 2015 Cape League batting champion. A Chula Vista, Calif., native, Calica was batting .427 entering his last game against the Cotuit Kettleers and was on the verge of entering Cape Cod Baseball League lore. Calica was poised to be the first Cape League player in 25 years to finish the season hitting better than .400. All he needed was a hit and he delivered, going 1-for-3 to achieve the feat. This summer, Calica's first with the Cape League, he had 16 multi-hit games, which helped keep his batting average over .400 for all but five games of the regular season. Calica's batting average dipped to .371 after the Gatemen beat Hyannis on July 18. Since then, Calica was batting .500 (24-for-48) heading into the final regular-season game against the Kettleers. He also became the seventh Wareham player to lead the Cape League in slugging. As a member of the UC Santa Barbara baseball team, Calica finished the 2015 season batting .329 with 69 hits, 19 RBIs, 13 doubles and 41 runs scored. He also received All-Big West Honorable Mention in his third season with the Gauchos. On top of his power at the plate, Calica uses speed to his advantage when moving around the bases. He successfully recorded 15 stolen bases with the Gauchos last season and finished with eight swipes with the Gatemen this summer. Before Tuesday night's game, Calica was crowned the league batting champion. 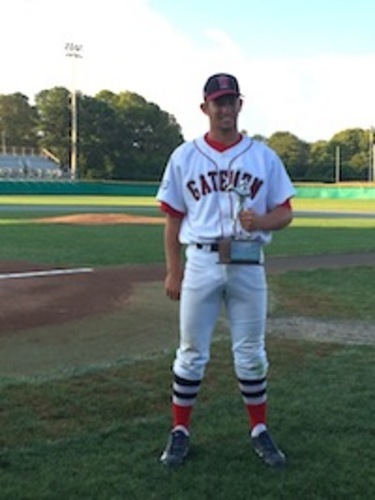 Afterward, he was presented with the Sylvia Bigelow Outstanding Position Player Award on behalf of the Wareham Gatemen. “Andrew Calica came in and did exactly what we needed,” Wareham GM Andrew Lang said during the presentation. With two honors under his belt, Calica found it difficult not to smile even after the season-ending loss to the Bourne Braves in Game 2 of the West Division semifinals.